It is with great pride that I present the Annual Report of Mourne Heritage Trust for 2014/15. While few years of our existence have been without their challenges in sustaining the Trust’s activities, 2014/15 proved particularly testing. In the final week of the financial year, a disengagement letter from the Department of the Environment - the Trust’s biggest core funder - gave notice of the early termination of the funding arrangement that had applied for over a decade. After subsequent positive engagement with the Minister for the Environment and his officials, a new Natural Environment Fund was put in place and an offer of funding secured for a further nine months (to 31st March 2016). In the period of uncertainty between these developments, our ‘#LoveMourne’ campaign elicited a huge number of expressions of support from elected representatives, community organisations, local people and visitors. An online petition was contributed to by 1,500 people (and counting!). 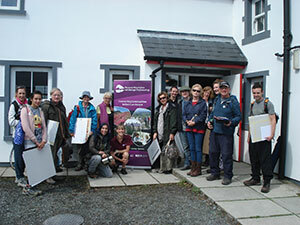 All were united and motivated by their appreciation of the special Mourne landscape and their desire to see it cared for. The thought that the services provided by the Trust in support of the Area of Outstanding Natural Beauty designation might, even temporarily, be considered ‘expendable’ came as somewhat of a shock to myself and my fellow volunteer Board members. The fact that such a scenario was considered unthinkable by many stakeholders played no small part in helping us navigate the choppy waters. While I cannot define with certainty what impact our campaign had on policy, I can say that the solidarity shown and the sentiments expressed about how people value what the Trust does were both humbling and morale enhancing. While we are acutely conscious of the ongoing pressures on government finances, I sincerely hope that the events triggered by the funding issues of early 2015 will mark a watershed in how special landscapes like the Mournes are seen in the hierarchy of government priorities for the future. Late March into early April of course also saw a watershed in local government, with the formal transition to new council areas and structures. Thus, the year we are reporting on represents that last in which the Mourne AONB was split across three Council areas. I would like to thank Banbridge, Down and Newry & Mourne District Councils respectively for the support and cooperation received over the 17 years of Mourne Heritage Trust’s existence. I am delighted that Newry, Mourne and Down District Council - the boundary of which was influenced by the Mourne AONB - has picked up the service and funding arrangements in place with its predecessors and I look forward to developing this new relationship. Remaining on the twin themes of continuity and change, I would also like to acknowledge the continued support of our other main partner, formerly Northern Ireland Tourist Board and now called Tourism NI. The flux and uncertainty around funding and institutional relationships inevitably diverted significant time and attention in 2014/15 and I would therefore like to pay tribute to the staff of the Trust who maintained commitment and focus in trying circumstances, continuing to deliver the breadth and quality of services and outcomes we had planned. 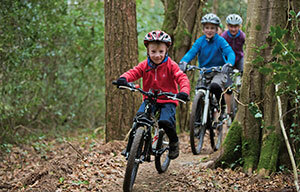 Highlights include ‘stitch in time’ works to safeguard the £3 million invested to protect the most vulnerable parts of the high Mourne path network and the surrounding sensitive habitats, along with the use of similar techniques and approaches to maintain the world class mountain bike trails in Castlewellan and Rostrevor. Our work to refine best practice in wildfire prevention and to examine the potential for use of controlled burning as a habitat management tool culminated in our first experimental burn on a site at Silent Valley. Beyond this, our work to protect and enhance priority habitats and species stretched from the uplands to the countryside and coast of the Mourne AONB. Similarly dispersed is the network of Public Rights of Way green lanes and amenity sites we maintain for the enjoyment of local people and visitors alike. 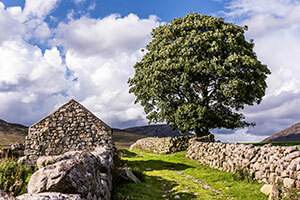 Our Mourne Mountains Landscape Partnership, anchored by a £1.5m grant from the Heritage Lottery Fund, had an emphasis on completing a suite of priority capital projects. Annalong Cornmill, Tollymore Forest bridges and follies, the Mourne Wall summit towers and our traditional dry stone field boundaries all benefitted from significant restoration works. 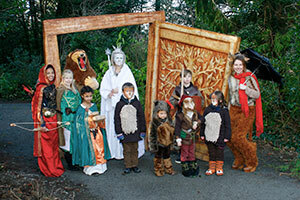 The Narnia Trail in Rostrevor caught the public imagination and our sustainable tourism activity focused on developing experiences around this and other focal points and key heritage themes. By the year end, the Mourne Cooley Gullion Geo-tourism project was nearing completion. The Trust continued to work with partners to guide this work and, crucially, to examine how the significant interest in geology and related heritage among local people and a signifcant tourism niche can be sustained and built upon. Our BIG Lottery funded Active Lifestyles programme also looked to the future, combining ongoing engagement of all sections of society in health and well-being enhancing conservation activities with early planning for sustaining these activities beyond the end of the current project funding in 2016. To conclude this overview of a busy year, I wish again to thank all those who so strongly expressed their support for the Trust as well of course as our funders, volunteers, partner organisations and my fellow Board members for demonstrating - perhaps more this year than ever - how much they all care for Mourne. Board met collectively on seven occasions through the year, while members also contributed through the Executive Committee, Natural Heritage Sub Group, Destination Mourne Mountains and Ring of Gullion Tourism Forum and Mourne Outdoor Recreation Forum, among other mechanisms. There were no changes to Board membership in the course of the 2014/15 year. However, with the reorganisation of local government in Northern Ireland coming into effect on 1st April 2015, a number of elected representatives from the former local authorities indicated an intention to step down. The Mourne Heritage Trust held its seventeenth Annual General Meeting aty Wednesday 8th October 2014 at Banbridge Civic Centre. The meeting was opened by Chair of Banbridge District Council, Ms Marie Hamilton with closing remarks by Ms Margaret Ritchie MP. The event marked the achievements of almost two decades of mutually beneficial partnership between MHT and Banbridge DC, with the reorganisation of local government to see the transfer of the portion of the Mourne AONB that was in the Banbridge district to the new Newry, Mourne and Down Dsitrict. The year saw a new Countryside team appointed as well as the addition of further staff capacity for mountain bike trail management. 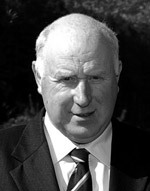 Mr Philip Savage replaced Mr Dave Keown as Countryside Officer. Mr Keown reached retirement but has chosen to continue to work with the Trust on a part-time causal basis. 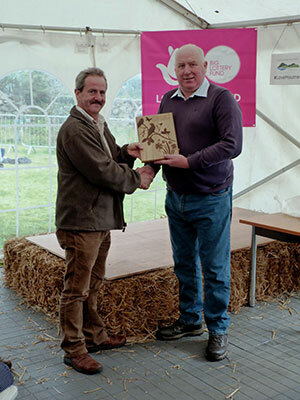 The Trust employed Mr Kieran Burden as high season seasonal Countryside Officer, and Mr Eddie Clarke as seasonal temporary Countryside Officers. Mr Dean Fitzpatrick, Mr Seamus Murphy and Mr James Martin were recruited in January to act as casual Mountain Bike Trail assistants and were employed at peak times through the year. 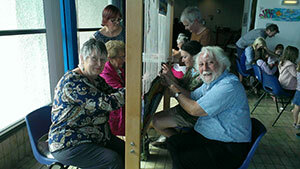 In January Ms Cathryn Cochrane left the post of Volunteer Co-ordinator for a positon with The Conservation Volunteers. At year end the post was vacant due to uncertainty over the Trust’s future funding. However, at time of writing a recruitment process had been initiated for the post to be filled in autumn 2015. The Management Plan was developed in 2010 through review of relevant research to provide a sound evidence base and extensive consultation with local people and other stakeholders to provide further insights and build consensus. It is relevant to anyone whose activity or decisions affect the Mourne AONB and not just a plan for Mourne Heritage Trust. Therefore, while it is a non-statutory document, the successful implementation of the Management Plan draws on the commitment of various agencies and local stakeholders to pursue these principles in line with their abilities, priorities and resources. With the action plan designed to cover the period of the 2010 to 2015 calendar years, the year in questions brings us into the ‘final stretch’. It is thus pleasing to see three quarters of all actions - a 9% increase – in the on or ahead of schedule category (which includes those that are complete). The considerable movement of projects to this category from the underway category reflected in part the significant progress with capital elements of the Mourne Mountains Landscape Partnership programme. Another £million plus funded initiative, the Mourne Cooley Gullion Geotourism programme had moved to substantial completion by year end. Also encouraging is the fact that only 5% of actions remain in the red category as we approach the final months of the plan period. It is not expected that all or even many more of the 7 remaining actions against which there has been limited or no progress will be progressed in the period remaining. However, given that in 2010 many of the actions did not have dedicated funding, that the plan is not statutorily binding and that the period saw considerable transition in government structures, a ‘failure’ rate of one in twenty actions is considered very respectable. We hope to build on our success in levering funding from a variety of sources and of effective partnership working to continue to achieve priority environmental outcomes in the next five year period. 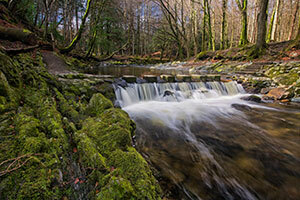 It is also worth noting that some opportunity projects not identified in the Management Plan, for example the restoration on Annalong Cornmill and Tollymore Follies. In addition other works, like wildfire control, heathland enhancement and new path creation, progress has or will progress significantly more than planned. Our work to protect and enhance the natural environment continued to be informed by the Mourne Biodiversity Action Plan and targeted priority habitats and species for which we could make a discernible positive improvement in condition. Before providing an overview of the many and varied activities that were undertaken in the course of the year, we will showcase two strategic and complementary areas of work that have been a particular focus in the past year. Efforts to address the significant risk of large scale wildfire in more remote areas and sensitive habitats of the Mourne AONB reached an important milestone at the end of 2014/15. Planning and staff training culminated in a series of trial controlled burns on a 5 hectare site between the Silent Valley and Ben Crom reservoirs in March 2015, with land managers and government departments observing. We worked closely with NI Fire and Rescue Service (NIFRS) in both the preparation for and execution of the work, and were also guided by Northern Ireland Environment Agency who granted the relevant statutory consents with appropriate conditions. The wider strategic approach that the pilot is testing involves starving a wildfire of its fuel by carrying out ‘prescribed’ burns to remove vegetation at identified critical control points, which subsequently act as strategic fire breaks to prevent an incident jumping from one valley or open plateau to the next. In this scenario NIFRS can then better allocate resources in a future incident, knowing that a wildfire will be slowed down or even halted in a ‘treated’ area. 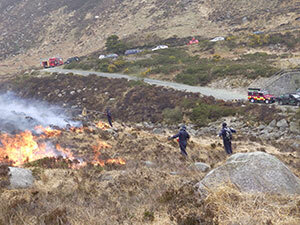 The strategy is in line with recommendations of the Eastern Mournes Wildfire Report (Wildfire Advisory Services, 2013). 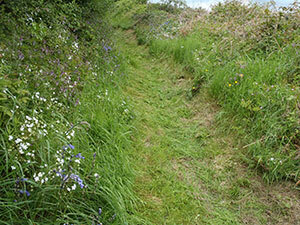 The approach also has the potential to enhance biodiversity and designated site features. 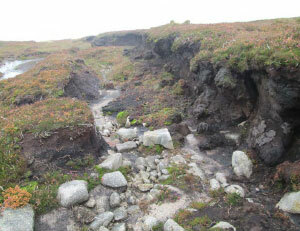 Of vital importance in this regard is the post burn recovery of the site and to this end the Trust, drawing on its in-house livestock management expertise, worked closely with graziers of the Eastern Mournes to ensure appropriate livestock management to optimise the recovery of key upland heath flora and limit regrowth of rank grasses and scrub. We look forward in the coming year to addressing further critical control points and in so doing adding to our emerging bank of learning and taking stock of the potential future value of this approach. In addition, the importance of monitoring the extent and impact of wildfires is critical to informing improved management, and the Trust’s Countryside team, rangers and volunteers contributed by carrying out post wildfire inspections across 3 major burn sites. This work, and the erosion control described elsewhere in this document will be greatly assisted by the all-terrain vehicle obtained through funding from the NI Environment Agency/ NI Environment Link NGO Challenge Fund, resourced by Carrier Bag Levy receipts. The strides forward in relation to practical interventions were informed by our ongoing development of policy and best practice, in which we took a lead role and engaged with experts across Europe. A Northern Ireland Wildfire Group meeting in April 2014 agreed that the Mourne project would proceed as pilot for the region as a whole, and a Mourne Wildfire Group was established, chaired by the Trust, that met twice in 14/15 working towards an integrated wildfire plan and towards a means by which to provide enhanced assistance to NIFRS in emergency situations. The developing partnership with NIFRS has been key, and together we provided a demonstration controlled burn for Ireland wide stakeholders in County Fermanagh and the Glens of Antrim, along with NIEA assistance. 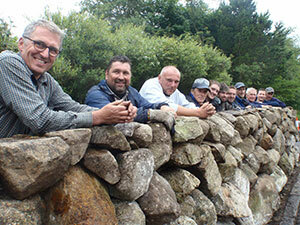 Our Countryside Services Manager presented on the Mourne project at conferences in Spain and Norway. Our Countryside staff worked closely with the Mourne Mountains Landscape Partnership team on a number of actions which complement the wildfire control in protecting and enhancing our upland heath. The ‘Healthy Heathland’ project aims to restore habitat, through the development of habitat management plans and implementation of practical restoration tasks for selected key sites. As well as being important in its own right, this work will contribute positively towards achieving ‘Favourable Condition’ targets for these sites to satisfy Northern Ireland’s commitments under European conservation designations. Initially, Annalong Wood had been chosen as the focal site for restoration. However, after further research - including a field visit with heathland experts from Moors for the Future in Yorkshire - the plan was adapted to address a wider selection of smaller sites with various negative pressures acting on them. In part, this decision was informed by consideration of the overall health of the Eastern Mournes Special Area of Conservation (SAC) and the need to increase connectivity between areas of heath/blanket bog, thereby reducing habitat fragmentation. Furthermore, as well as spreading the visibility of the work – and thus its demonstration value - this approach will allow us to employ a wider range of practical restoration techniques, in turn increasing the skills base of the staff and partners involved. The restoration works that make up this exciting project will now commence in 2015/16. The Active Lifestyles project, funded by BIG Lottery, continued to drive participation. Our partnership with Mediation NI and asylum seekers group AMAL (primarily people from Sudan, but also Algeria, Eritrea, Ethiopia, Iraq and Syria) involved members in upland path work, heathland management, dry stone walling, tree nursery work and litter lifting. 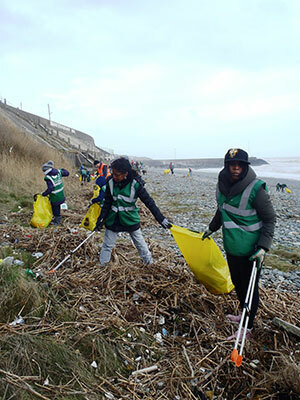 While the hardier types tackled the High Mourne activities, beach clean-ups proved very popular with AMAL’s family groups and the success of the partnership has clearly been the involvement of all ages and abilities in the conservation work. To celebrate this and build friendship across the Trust’s volunteers, a cultural exchange day was held at Shimna Integrated College in Newcastle, open to all MHT conservation volunteers and friends and families. As well as, a presentation by the AMAL group about the Marrah Mountain range in Darfur, and a talk on the geology of the Mourne Mountains from Siobhan Power of Mourne Cooley Gullion GeoTourism Project, there was a Mourne/Marrah natural heritage and cultural quiz, games, Irish dancing and a Sudanese BBQ! We aim to hold a similar activity in 2015/16 as part of consolidating a sustained partnership after Big Lottery’s Reaching Communities funding ends in July 2016. At another part of the volunteering spectrum, corporate and business groups continue to develop with Citigroup and Lloyds/Halifax among those delivering 138 activity days cleaning up litter from beaches and carrying out upland path repairs. 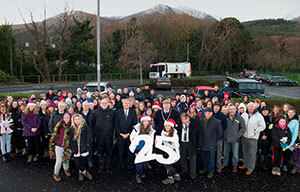 The Trust was also delighted to support Belfast Royal Academy in its 25th annual Mourne litter lift in December 2014, where more than 130 students, staff and volunteers cleared more than 6 tonnes (approximately 10 cubic metres) of waste and rubbish that had been dropped or dumped in the Area of Outstanding Natural Beauty. 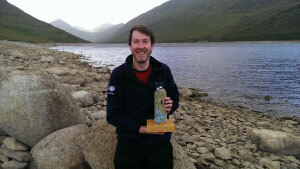 Personal recognition in the form of the annual Mourne Natural Heritage Awards was given to Charles McRobert for his commitment to volunteering, in particular his excellent monitoring of native juniper which informs the Trust’s juniper restoration project. A group award recognised the contribution from South Eastern Regional College under the guidance of lecturer Brian Murray. A planning day was facilitated by Sector Matters through an arrangement with BIG Lottery. A representative group of participants worked with MHT Board members through a SWOT analysis and shared experiences and ideas for sustaining the project. A key finding was that the inclusion of groups with particular special needs was a major success of the project and one that set it apart from other conservation volunteer projects, and should be sustained if possible. The findings were presented to MHT’s Board, which endorsed the plan and MHT will tender for a consultant to produce a detailed sustainability plan later in 2015. The Mourne AONB is the most heavily used area of Northern Ireland for outdoor recreation due, among other things, to relatively good access to the countryside (much of this de facto and thus requiring sensitive management) and to its proximity to the Belfast and Dublin metropolitan areas. In the course of this year, after refinements in equipment and positioning, our network of electronic pedestrian counters at strategic locations in and around the uplands produced a comprehensive and robust set of data for a full 12 month period. We have set out below the counts for the report year. This large number is of course only a snapshot of use of the landscape given the variety of entry points to the hills and that it does not take account of sites like Silent Valley and Forest Parks where MHT’s services are also deployed. The Mourne AONB also contains two long distance accredited routes and over 20 other Quality Walks, most of which are managed by the Trust. Spring 2014 saw a celebration event marking the successful completion of the extensive programme of upland path works carried out over the previous four years involving approximately £700,000 of investment - not including the very significant volunteer input. 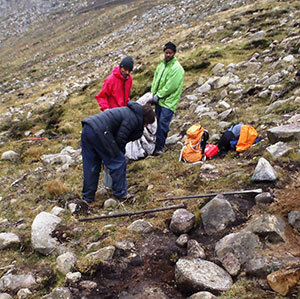 As well as contracted works around Slieve Binnian, the Brandy Pad and Slieve Donard, this included ‘stitch in time’ and ‘stay on track’ works by the Trust’s countryside staff in key access corridors. Tollymore National Outdoor Centre was the venue for the event with Minister for the Environment, Mr Mark H. Durkan the special guest, recognising the role of Northern Ireland Environment Agency as a major funder alongside Sport Northern Ireland, Northern Ireland Tourist Board and Heritage Lottery Fund. Please see the comments of the Minister and other guests below. 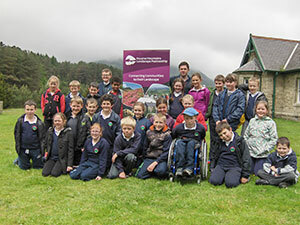 ‘This project makes the increase in participation in hillwalking and outdoor recreation sustainable in the longer term, and will allow us to continue to deliver the benefits of the mountains to the health and well-being of society. Organisations such as the Ulster Federation of Rambling Clubs, Mountaineering Ireland, Duke of Edinburgh and the An Gaisce award schemes, with over 9,000 young people using the Mournes per annum, will benefit from these improvements’. 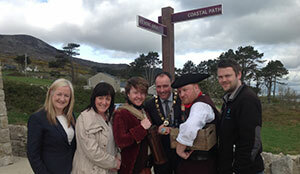 ‘I commend Mourne Heritage Trust for its ground-breaking initiative. It is important to the environment, economy and people of South Down that we continue to protect the environment and improve the user experience in Northern Ireland’s foremost area for upland recreation. I thank the funders and public and private landowners for their cooperation and look forward to these relationships continuing to prosper for the good of all’. A significant priority for the remainder of the year was safeguarding the positive impacts of the above investments and, accordingly, post project monitoring, maintenance and appropriate alterations occupied a significant proportion of the time of our Ranger and Countryside teams. 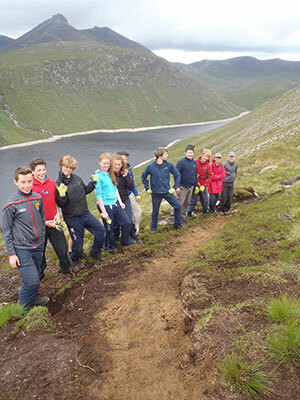 The Binnian link path at Ben Crom was extended to 700m through the work of volunteers, completing the link to Binnian col, whilst also planning new sites for the volunteer path team to tackle (see below). 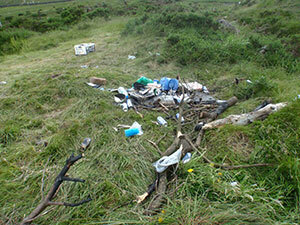 Landowner engagement and practical works were undertaken to address access issues at Browne Knowe (Annalong Valley), Spence’s Mountain and Killowen (Rostrevor) as were litter and other clearance after unauthorised camping on private and public lands notably at Annalong wood, Bloody bridge, Glen River, Trassey and Happy Valley. The Countryside Team responded to issues at car parks by re-landscaping a badly vandalised earth bank at Ott, repairing damaged dry stone walls at Dree Hill, and remedial work to upgrade Ecogrid car parking bays at Playrock. 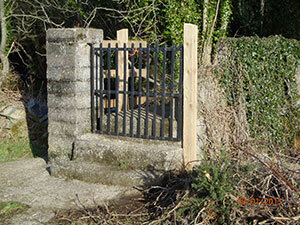 Refurbishment of stiles and gates was carried out at Cow Lane and Lower Buren, and storm damaged trees were cleared on lanes around Maghera. The Mourne Outdoor Recreation Forum was convened in June and from this Working Groups met in the Autumn to prioritise recommendations under the Mournes & Slieve Croob Strategic Path Review (2012). Considerations included where the focus should be for contractor work, in-house teams and volunteers and to address the issue of waymarking large events, with the latter making progress towards agreement of a best practice waymarking protocol. This complemented ongoing monitoring of large scale events and liaison with organisers, particularly in relation to the vulnerability of parts of the Mourne Way. A wild camping survey was designed in conjunction with Sport NI and Duke of Edinburgh Award for completion in the summer 2015. Returning to the importance of safeguarding the investment in path repair that we celebrated in April 2014, development of capacity for consistent, longer term ‘stitch in time’ preventative works through a dedicated path team is also among the recommendations of the Strategic Path Review. Two funding applications were prepared and submitted in the course of this year but were ultimately unsuccessful. Development of capacity to keep pace with the increasing recreational pressures on the path network of the AONB still remains a key priority. 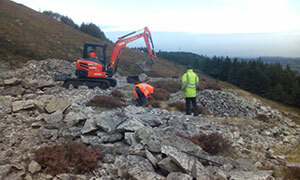 The Countryside Services Team, in particular the Area Ranger, supported the Mourne Mountain Landscape Partnership in trail development work including provision of specifications and contractor supervision at the extended Granite and Cloughmore Trails. The mountain bike experience was also enhanced this year through development of our Mountain Bike Ranger service, including additional casual staff for user engagement and trail maintenance. This helped free up our Trail Ranger to scope solutions to issues raised in user feedback. 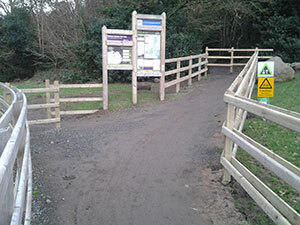 This included facilitating a process to respond to flow issues on the two downhill trails, allowing the planning of minor adjustments to enhance user experience, whilst maintaining a robust trail design protocol. Events facilitated include the Irish Downhill Mountain Bike Series on 19/20 July 2014; Rostrevor Adventure Duathlon 27th July 2014; Ulster Cross Country Championships Castlewellan 24th August 2014; Irish Mountain Bike Marathon Championships Rostrevor 14th September 2014. 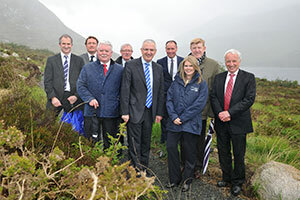 Celebration event marking completion of the extensive programme of upland path works over four years involving approximately £700,000 of investment (resourcing ongoing capacity to keep pace with the increasing recreational pressures on the path network remains a key priority). Our Sustainable Tourism Officer continued to work closely with MHT colleagues to lever tourism value from the various natural, built and cultural heritage projects undertaken. Collaboration with partner organisations also ensured coherence and strategic impact of developments across the Mourne Mountains & Ring of Gullion destination. 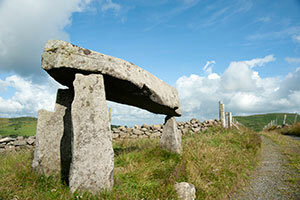 The Mourne AONB is steeped in stories, myths and heritage. Our ‘legends within the landscape’ range from the role of the Mournes in inspiring the magical world of Narnia created by C S Lewis to the very real achievements of the skilful and hardy Mourne people in industrial heritage - whether through the construction of the Silent Valley Dams or building the Mourne Wall or quarrying granite. A key step in our approach has been the development of tangible focal points for interpretation and celebration of these ‘Living Legends’. A number of the infrastructure projects came to completion in 2014/15 and accompanying industry capacity development enhanced awareness of the new tourism products and the special heritage they interpret. Tours, video presentations and discussions were complemented by one to one meetings with tourism business to focus on how they could showcase and capitalise on our key experiential themes. 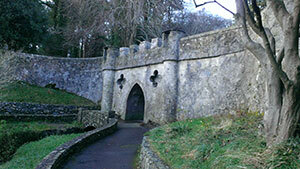 Business stakeholder workshops took place at Kilbroney Park, focused on the Narnia trail launched in January 2015 and the legends associated with Fionn McCool and the ‘Big Stone’ and at Annalong, focused on themes related to the interpretive exhibition in the restored Cornmill, which formally opened in October 2014. The new attractions also proved particularly popular with some of the FAM visits we facilitated, including a tour for US business and incentive travel operators. Another project to add a layer to the Mourne experience was the restoration of fifteen historic stone structures – bridges, gates, follies, obelisk – in Tollymore Forest Park. On site interpretation, short films and guided walks animated the story of these idiosyncratic aspects of the built heritage, designed by legendary landscape architect, Thomas Wright, ‘the Wizard of Durham’. 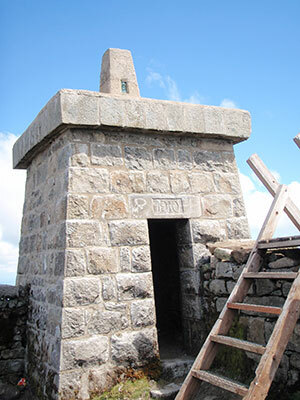 While on site interpretation was not appropriate at the restored Mourne Wall summit towers, video and print media were employed to tell the tale of these iconic structures which, literally and metaphorically, stand out in the landscape. 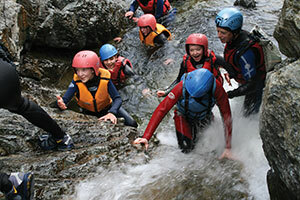 In this theme Tourism NI considers ‘all activities that involve a combination of physical activity; cultural exchange or interaction; and/or an engagement with nature’. 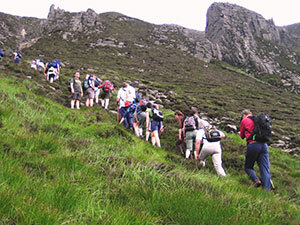 The Mourne AONB is, of course, synonymous in Northern Ireland with outdoor activities. As well as the day to day services to maintain the infrastructure required to facilitate activities and ensure they are sustainable – as described elsewhere in this report - the Trust plays an important role in developing new access opportunities. A key addition this year is the Granite Trail extension, adding loops that take in more remote locations like Drineveer quarry. The story is also featured on our ‘Mourne Granite Story’ App, now available from the App Store and Google Play and a short film have proven popular. This project of course highlights the degree to which many of our initiatives deliver across more than one experiential theme, contributing significantly to Living Legends. So too do the Silent Valley walking routes, formally launched in July 2014 to help people explore the industrial heritage of the Silent Valley as well as appreciating its stunning setting and biodiversity. 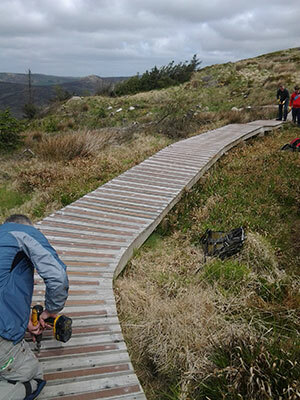 These actions complemented the £3m repair programme in the upland path network that we celebrated in April 2014 with the Chair of Northern Ireland Tourist Board among the speakers. In facilitating recreation in our unique outdoors, we have continued to develop ways by which people can delve ‘beyond the view’ and appreciate the distinctive biodiversity and geodiversity. The Mourne Cooley Gullion Geotourism project included the ‘Geo Expo’ event in Newry in June 2014 - which brought academic institutions and tourism businesses together for discussion of further development of ‘edu-tourism’ – and the development of a detailed geo interpretation strategy. Examples of ‘biodiversity experiences’ include our progress with Red Squirrel re-introduction and completion of designs for phase 1 of a ‘sensory garden’ at Silent Valley. In addition to visitors, biodiversity events attracted tourism businesses wishing to better understand the wonderful variety of nature around them. These included boat trips to view sea birds, a whale watch event, wildlife gardening classes, bat watch and butterfly and moth identification. We appreciate that aspects of the infrastructure for accessing the outdoors remain underdeveloped compared with the standards we aspire to, notably car parking provision in some ‘honeypot’ locations and work continued to identify and develop opportunities for improvement. For example, information from our network of electronic visitor counters helped identify need for further provision at the Trassey valley and we provided input to Down District Council for the development of plans for additional capacity which by year end had received planning approval. We also worked closely with Council to critically examine innovative ways in which access to the Mournes can deliver new experiences and/or cater for new target groups, such as those with lower mobility. Among other things, this culminated in the outline scoping of new access and activity provision at opportunity sites including Thomas’s Quarry on Slieve Donard. With regard to future planning for other sites, we provided input to scoping studies on recreation opportunities for Mourne Forests, while the Mourne Outdoor Recreation Forum (convened by MHT) provided a vital information gathering and ‘testing ground’ for the Mourne Outdoor Recreation Strategy prepared by Outdoor Recreation NI. Finally for this pillar, MHT continued to work with Sport NI and other partners to plan and programme the Nature & Sports Euro’meet to be hosted in Newcastle in early autumn 2015. This will put the Mournes at the centre of an important European network, providing an opportunity to celebrate our unique outdoors and to consider how we sustainably develop its potential with experts from beyond our shores. 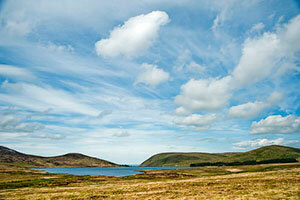 The Mourne Coastal Route developments are an important element of fulfilling the aspiration for this pillar. This year saw a launch event for the final amenity site to be upgraded on the main spine of the route, namely Bloody Bridge. Pre-development work proceeded with a view to plugging gaps in our amenity site provision, primarily in and around the four coastal route scenic loops. Sites were audited by MHT staff and possible improvements scoped. Enhancements at Spelga Dam, a key hub site on the ‘High Mournes’ loop, were significantly advanced by year end in conjunction with our partners in Mourne Cooley Gullion Geotourism. 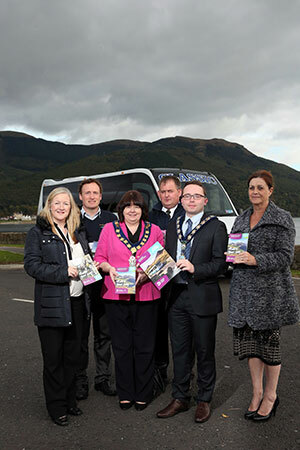 In collaboration with Tourism NI the and Councils, we produced a Mourne Coastal Route guidebook for the coach industry, launched in October 2014, and provided input to a Council led marketing plan for roll out in the coming year. Of course marketing activity continued while the plan was developed and we contributed to various print and visual media features on the route and to the hosting of tour operators FAM visits. Also, in conjunction with Councils, we secured funding from the South East Area Fisheries Local Action Group for a scoping study of coastal walking and cycling routes to further develop the activity opportunities adjacent to the touring route. By year end a tender process had been completed and the work awarded to Outdoor Recreation NI and field survey work, with technical input from MHT, had commenced. Reflecting the importance of the Mourne destination to this pillar we contributed to development of policy and practice, providing input to NITB Pillar Plans and working groups for both Coast & Lakes and Unique Outdoors. MHT also provided input to the ‘Living Legends’ handbook and input on tourism related aspects of the draft NI Rural Development Programme. Also important, in relation to the policy context for tourism development around our coast and lakes were the ‘Northern Ireland Water Draft Social and Environmental Guidance for Water and Sewerage Services’ and the ‘Long Term Water Strategy 2014 – 2039’. Both contain specific objectives relating to tourism, recreation and biodiversity enhancement. This pillar concentrates on the intangible including literature, music, events and arts. One way in which we have contributed is through the use of contemporary art to interpret key heritage themes. Our comprehensive public art programme now comprises ten pieces, with installation in the year of three pieces at Banbridge, Castlewellan and Bloody Bridge, where the ‘Smuggler’s Head’ has proven particularly popular. 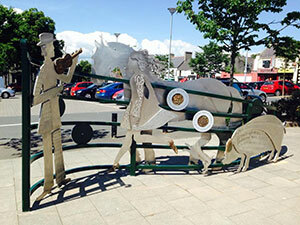 As an ‘added bonus’ we obtained funding from the Arts Council for a final piece in Hilltown. A facilitator worked with the community to tease out possible themes, following which a selected artist was approved. 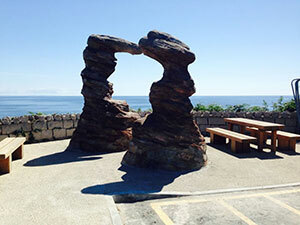 Other activity relevant to this pillar centred on the iconic stone walls of Mourne with artistic workshops in which local people and visitors interpreted these features in paint and sculpture. Music workshops and our drama summer schools involved mostly local people and their outputs have the potential, which we will seek to develop, to enrich the visitor experience in years to come. The music workshops will result in the creation of a ‘Mourne Songbook’ of pieces inspired by the landscape generally. 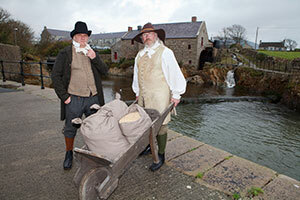 The drama focussed on the specific themes of granite and smuggling and equipped participants with the capacity to animate these local stories. 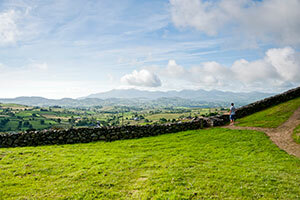 Naturally NI is defined by Tourism NI as ‘everything that cannot be replicated’. Our work this year contributed particularly to two of the three strands of this pillar; ‘Our People & Our Stories’ and ‘Our Crafts’. 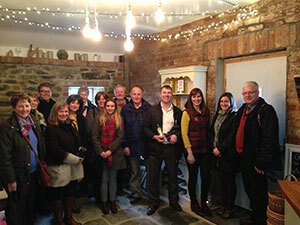 In relation to crafts, a study trip introduced local artisans to the ‘économusée’ approach to showcasing traditional trades and know-how through visits to Scullion Hurls and Broighter Gold. 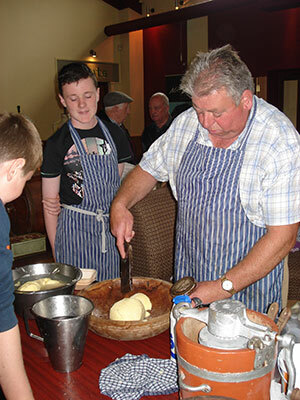 We helped to develop events celebrating traditional local skills, supporting both the Mourne Threshing day and Hilltown Hidden Heritage festival. Storytelling training engaged twenty enthusiastic local participants and established a storytelling network. We worked to further develop the capacity of these individuals through providing ‘open-mic’ sessions in hospitality venues and making links between them and tourism providers. 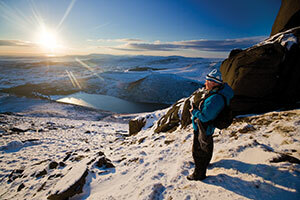 An aspect of the Mourne experience that the Trust has worked on since its establishment is ensuring the sustainable credentials of tourism in the area. We were delighted this year to assist with the Green Tourism Business Accreditation scheme, which was led by our local Councils. The response evidenced the progress previously made through the Trust’s pilot green accreditation scheme and subsequent work under the European Charter for Sustainable Tourism. We also took great pride in the success at the inaugural Irish Responsible Tourism Awards of Tory Bush Cottages and Life Adventure Centre for whom we provided supporting evidence and references. This was a significant year for the Landscape Partnership in terms of outputs and expenditure against the themes outlined. A number of the key capital projects completed by October 2014 and initial feedback was very positive. Complementing these were the ‘softer’ elements, through which people expressed their appreciation of the landscape in a variety of ways. We have chosen one capital and one non-capital project to exemplify the work done and follow this with a round-up of the many and diverse other activities and achievements of the programme in the year in question. Restoration and adaptation of the built fabric of Annalong Cornmill completed in April 2014, with the interpretive exhibition following in October of 2014 after a detailed programme of consultation and research. This culminated in the production of an audio trail within the Cornmill, providing visitors with detail on 3 keys themes – the milling story, the harbour and the local granite industry. Consultation prior to the development of the action plan for the partnership identified the need to tell the story of Mourne granite and to showcase the skills of the stonemen who battled the elements to build iconic structures such as the 22 mile long Mourne Wall. 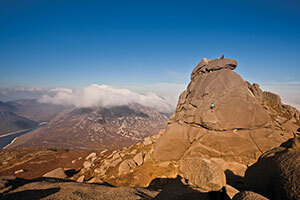 ‘The Mourne Granite Story’ App was also developed as part of this project. This free app allows visitors to learn more about the remnants of the granite industry that are peppered over the landscape in the Bloody Bridge, Trassey and Granite Trail areas. The official launch of this flagship project on the 22nd October 2014 recognised the funding partnership of SOAR (Rural Development Programme), Northern Ireland Environment Agency Historic Buildings and the Heritage Lottery Fund. A Big Weave artist held workshops in each of the schools, with GCSE Art students asked to design their paintings on the unique characteristics of the Mournes. A total of 11 paintings were produced by the 4 schools. Another artist from the Big Weave extracted design elements from each of the paintings and condensed these into 4 unique and colourful designs, depicting Kilkeel, Newcastle, Castlewellan as well as a general panoramic view of the Mournes. With design completed, the project moved into the next phase – the weaving. This began in late August and the looms moved around nine community venues across the Mournes, enabling members of the local community and visitors to weave a little bit of these amazing tapestries. The Big Weave was exhibited in the Long Gallery in Stormont from the 10th – 21st November 2014 after a reception, hosted by Mr John McCallister, MLA. All 4 schools were in attendance and each was presented with a gift of peg looms and wool (in their school colours). The looms will encourage the continuation of weaving within the schools’ art departments. ‘I was honoured to have these wonderful works of art displayed in the Long Gallery. Politicians and visitors alike have been commenting on the tapestries and everyone has been reminded of the beauty of the Mournes through the art of weaving. The project began earlier this year and has been a unique way of linking communities and bringing people together’. ‘We are delighted that the Mourne Heritage Trust has brought the Water Towers and other features of the Mournes to life in this series of films. They will make an excellent resource for the visiting public and education groups who have an interest in the Mournes and the rich history that can be found within them’. Extensive juniper survey completed and presented to key stakeholders. First planting out of nursery propagated plants.